Being the first day of summer, it is time now for the Spring Reading Thing wrap-up. My original post (here) outlines the few books I had on my list. I made it through most all my books and then a few more. I'm still working on Why You Say It by Webb Garrison (one of my Book Sneeze reviews). I am still a big fan of Sandra Brown - good thing she is a prolific writer! The most meaningful book I read this season was the Five Love Languages for Singles by Gary Chapman. I had heard of the original Five Love Languages book, but hadn't ever read it. This had the same determination quiz, but the stories and recommendations were geared towards singles. Taking the quiz reiterated what I've known for a while about what my love languages are and my parents both took the quiz while I had the book at my house. That enabled us to have a good conversation about how our family operates. More communication is always a good thing! So, last weekend I was home for Emily's birthday party. Heather did a great wrap-up post with lots of fun pictures. Rather than duplicate her post, I'll just send you over there. Heather, Phillip & Emily are moving to Abilene this week. So, after the fun birthday weekend, I headed back to their house to help pack. What I actually did was play with and distract Emily while Heather packed in the mornings and then we packed together while Emily napped in the afternoons. It was fairly exhausting, but I'm so glad that I was able to take the time and do it. I know Heather is feeling much calmer about these last couple of days because she isn't frantically trying to get it all thrown in boxes! Their stuff will be in storage for most of the summer while they stay with my parents before their house is available, so I also brought some stuff back to store temporarily at my house. Nothing else too exciting going on here.....it's a busy work week coming up. E's birthday is coming up this week, so when we went to Toys R Us for some present shopping, she got her crown and "buhv" (balloon). Lots of throwing balls and climbing up and down the deck in the back yard. She had so much fun!! Grandpa and Emily share a floor picnic snack! 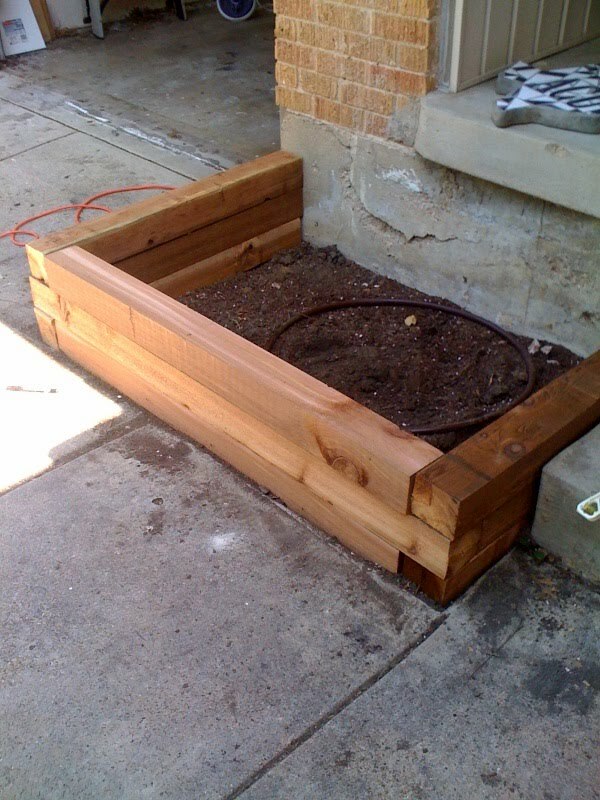 Built a cedar planter today. Still need to get dirt and flowers.